What's it like to be a NASA intern? And what's it like to be a NASA intern on the hunt for an aircraft jet engine fuel mix that's fire-safe and environmentally friendly? Aeronautics Scholarship recipient Sean Currey spent his summer working at NASA's Glenn Research Center in Cleveland. Test chambers, test cells, protective eyewear, electrodes and everything to do with "minimum ignition energy" made up part of his daily routine. "We want to create alternative fuels that not only improve aircraft efficiency and reduce emissions, but that are also harder to ignite. This will help prevent accidental ignitions in new aircraft similar to those that caused catastrophic fuel tank explosions in the past," Currey said. The goal is to use the fuel itself to prevent explosions instead of having to add heavy or power-intensive equipment that might prevent an ignition but might also increase aircraft weight and emissions and decrease overall efficiency. NASA intern Sean Currey answered your questions on Thursday, September 2, at 3:00 p.m. EDT. A transcript of the chat will be posted soon. Sean is a mechanical engineering major at Dartmouth College in Hanover, NH, and recipient of a NASA Aeronautics Scholarship, which includes a summer internship at a NASA center. This was Sean's first internship at NASA. Originally from Manhattan Beach, California, he's also worked as a research assistant at a rocket lab, was managing editor of Dartmouth's Undergraduate Journal of Science, studied aeronautics in Thailand, and developed a computer keyboard that self-sanitizes using ultraviolet lights and a scrolling cover system. (Moderator) Jason: Welcome to the 'In Search of the Secret Formula for Future Fuels' Chatroom. We're chatting with NASA intern Sean Currey about all the fun he had working at NASA this summer on future jet aircraft fuels that will be both safe and more environmentally friendly. This is a moderated chat. To submit your own question, please type it in the box at the bottom of the window and click the 'Ask' button on the right side of the box. Thanks for your patience as we answer your questions. Mr._Osbourne: I'm a high school math/physics teacher. What would you recommend students studying in high school and college in order to be where you're at (researching fuels)? Sean: I'm actually going into my senior year in college (I was an intern when I was doing this research). I took as many science and engineering and math classes as I could in high school. Almost all science and math classes are helpful in studying any field of engineering. I also think that communications and writing skills are important when working on engineering research projects. AkarshValsan: It is interesting to know that aircrafts fly with a fuel derived from babassu nuts and coconuts. Can you explain this as a part of Green Aviation? Sean: Biodiesel fuels are an exciting new area of research. However at Glenn I primarily worked on synthetic fuels based upon non-petroleum resources rather than plant-based bio-fuels. Daniela Cruz: Jason....what do you think cause the recent accident of Air France returning from Brasil? Sean: I really don't know. (Moderator) Jason: Sean is a NASA Aeronautics Scholarship recipient. If you're interested, the application period for Fall 2011 just opened. Go to http://nasa.asee.org. Amber: What is the significance of the green frog in the above picture? Sean: My mentor, Dr. Martin Rabinowitz, is very fond of frogs. Unfortunately he never shared the source of his undying passion for these jumpy green creatures, although they do signify the giant leaps forward we plan to make in alternative fuel technology at NASA. Dell_Conagher: What did you have to do to get your internship? How hard was it? Sean: I was awarded my internship at Glenn by NASA's Aeronautics Scholarship Program; a very generous program run by the Aeronautics Research Mission Directorate and the American Society for Engineering Education. Please see the link above and the application period for 2011 just opened. The hardest component of the application was the aeronautics essay, which asked to consider the current greatest aeronautics challenges in the next 20 to 25 years. Mr._Osbourne: In the article for this chat, I read that you're hoping to be more economic with the fuels by saving weight. Do you see the fuels getting tested actually being cheaper pound-for-pound? Sean: NASA's primary focus areas of research in subsonic aircraft technologies are to reduce aircaft emissions, increase aircraft performance, increase safety and reduce noise. By creating fuels that burn more efficiently we will use less fuel. And therefore reduce environmental emissions and hopefully the amount of fuel burned overall. 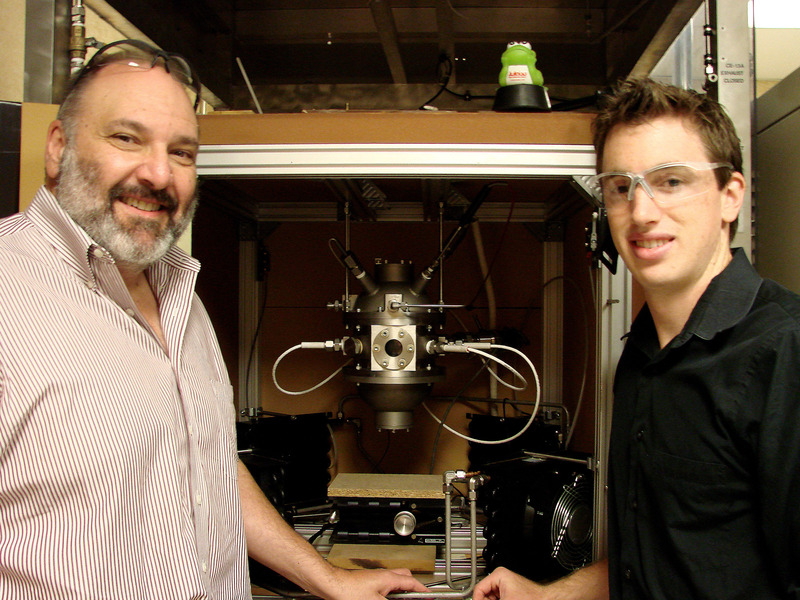 Gray: Sean, what is that interesting test rig that you're working on in the photo? Sean: That's our combustion rig. We use it to test for the minimum ignition energy of various chemical compounds. In that photo I had just placed fuel inside of the tank and I'm preparing to ignite it with the electrodes inside. Wachen: What's the most surprising thing you learned this past summer at Glenn? Sean: Just the scale of the research that goes on at NASA. Between the 5.18-second microgravity drop tower, the Icing Research Tunnel, and the 10-ft x 10 Supersonic wind tunnel, the testing capabilities at NASA are unmatched. Dell_Conagher: Had you done work with jet fuels before your internship? If not, how did you pick up the needed skills and knowledge for work? Sean: I had no direct aeronautics research before working at Glenn. But I enjoyed studying chemistry and physics. I picked up the skills through various research projects and academic projects in laboratories. The Thayer School of Engineering at Dartmouth teaches a wide variety of skills necessary to perform well at NASA or at any other agency. (Moderator) Jason: We're working to answer your great questions. Keep them coming! To submit your own question, please type it in the box at the bottom of the window and click the 'Ask' button on the right side of the box. Thanks for your patience as we answer your questions. tjg1978: Will the fuels you are researching be used in chemical rockets, or are you also looking for alternative fuels for plasma or Ion rockets like VASIMR? Sean: As far as I know, the research will be applied to fuels that stay below Earth orbit. AkarshValsan: What is the main difference between synthetic and bio-gas fuels? Dell_Conagher: What were some of the methods you used to lower the minimum ignition energy? Sean: That energy is dependent on a variety of factors including the length of the spark we sent through the mixture, the temperature and the ambient oxygen concentration. By lowering the oxygen concentration we could effectively raise the minimum ignition energy of the fuel mixture. EmilyS: Why do you want to create more altenative fuels? Sean: The performance of current and future aircraft is limited by the jet fuel we use today. To build more efficient aircraft, we need to start designing new fuels around future aircraft rather than designing aircraft around current fuels. Dell_Conagher: How does a low ignition energy affect engine proformance? Does it require more energy to start combustion? Sean: Our main purpose of testing a minimum ignition energy was to analyze the safety of the fuel while it's sitting in the fuel tank. Fuels with a low ignition energy can easily be ignited by a short circuit or other source of inadvertent ignition. TWA Flight 800 is a prime example for the need to create fuels that are harder to ignite. EmilyS: How does an aircraft work? Sean: In Akarsh's first question about nuts and coconuts, I need to correct that I worked with *organic* chemical compounds but they weren't derived from plants. Sorry 'bout that! Mj: What will you do after you graduate? Sean: I hope to get a master's degree and perhaps a PhD in aerospace engineering, but afterwards I also hope to keep NASA in my sights. Katie_Paxton: What are some everyday applications for the work you're doing? Sean: Hopefully in the near future when you fly in an airplane somewhere you'll be in an airplane using these new fuels. And as I said earlier, the everyday benefits - NASA's goals anyway - are to reduce emissions and improve aircraft performance and alternative fuels help in both those areas. Charlie: What was the best part about your internship at NASA, and why? Sean: Meeting all the brilliant minds that work at NASA. There're so many people working on exciting, complicated and game-changing technologies there. And everyone loves talking about their work. Jvarilek: You had mentioned earlier that the fuel would be used for aircraft within the Earth's orbit. Does that mean that once Nasa invents the technology they would then sell it to private companies? Sean: The best part about research coming out of NASA is that the results are shared and made widely available. Jvarilek: Where did you leave the project off at? Did you feel like you were making progress? Sean: I was only at Glenn for 10 weeks - not enough time to see the project through to its end. But I think we made substantial progress in learning about the minimum ignition energy for iso-octane - a chemical compound that will likely be used in future fuels. AkarshValsan: Is Cornfuel a biofuel? Dell_Conagher: To alter the ignition energy, do you alter just the environmental factors, or actually add something to the fuel? Sean: During my studies we altered only the environmental factors. We looked at changing the temperature and ambient oxygen concentration inside the chamber while keeping the equivalence ratio (the ratio of fuel to air) constant. We would look at the pressure sensor to look for a spike in pressure to show an ignition had occurred. We of course had a safety door over the rig and the chamber window. (Moderator) Jason: We're working to get through all of the great questions you've asked us. Keep them coming! To submit your own question, please type it in the box at the bottom of the window and click the 'Ask' button on the right side of the box. Thanks for your patience as we answer your questions. Jvarilek: At Glenn did you work with just your mentor or did you have a larger group of team members to work on the project? Sean: I worked very closely under Dr. Rabinowitz, but I was fortunate enough to enlist the help of two technicians when I was working with the rig itself. The other scientists and engineers at NASA were also willing to take me and other summer interns on tours of their facilities. Charlie: Were there any engineering tradeoffs you had to consider when you were researching new fuels? Sean: The research was so preliminary - at a fundamental level - it concerned only the safety of future fuel components. We focused solely on the value of the minimum ignition energy and did not consider other factors during our particular project. Sean: I believe you're thinking about something that applies to chemical rockets. During my internship, I didn't work in that area. Sean: That's a Federal Aviation Administration initiative. I invite you to check it out online. y.lin: Did you feel like you had any advantage or disadvantage (both at your internship and in the application process) coming from a school that is generally more focused on liberal arts? Sean: I would say I have a strong advantage. A liberal arts-based education forces you to become well-rounded and well-versed in a broad spectrum of science and engineering topics. Thayer School also promotes team-building and communications skills, which allow students to effectively share results with others in a scientific setting. Dell_Conagher: A self-sanitizing keyboard seems maybe to be a far cry from jet fuel. :) How did you come up with the idea for, and develop, your keyboard? Sean: The keyboard was developed for Thayer School's Intro to Engineering class. It was my first real experience designing and building a product from scratch. It really did work. However, it's much easier to design a keyboard than an aircraft. My love has always been with aeronautics and aerospace technologies, but it's hard to design an entire aircraft engine in just 10 weeks. Sean: Okay , we're done! Thanks everybody for their great questions. I hope you get to have, at some point, the same kind of experience I did. For those of you applying for the NASA Aeronautics Scholarship, best of luck to you! (Moderator) Jason: Thanks Sean for the great answers to everyone's questions. We appreciate you taking time out of your day to sit down with us. Sean is a NASA Aeronautics Scholarship recipient. If you're interested, the application period for Fall 2011 just opened. Go to http://nasa.asee.org. Come back next Thursday at 3:00 pm EDT for a chat with NASA intern Heather Arneson, who used math and simulations to find new ways to help aircraft move through areas of bad weather. 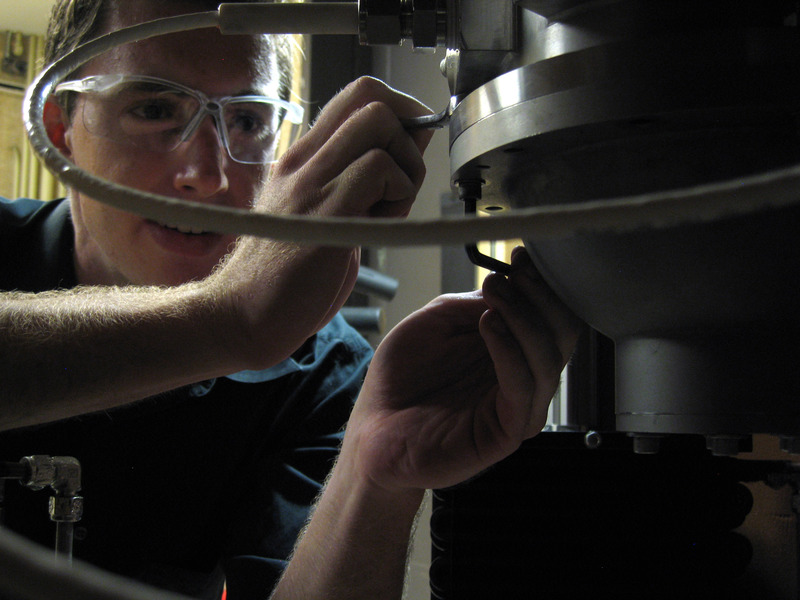 Intern Sean Currey seals the Storage Safe Fuels test rig in test cell CE-13A at NASA's Glenn Research Center.